Illustration used in back cover advertising for White Smith & Co. sheet music. The drawing first appeared as a black and white etching in the mid-1870s and was hand-tinted later in the century for use when the company began publishing color covers. A list of the company’s recent publications would appear underneath the commemorative artwork. 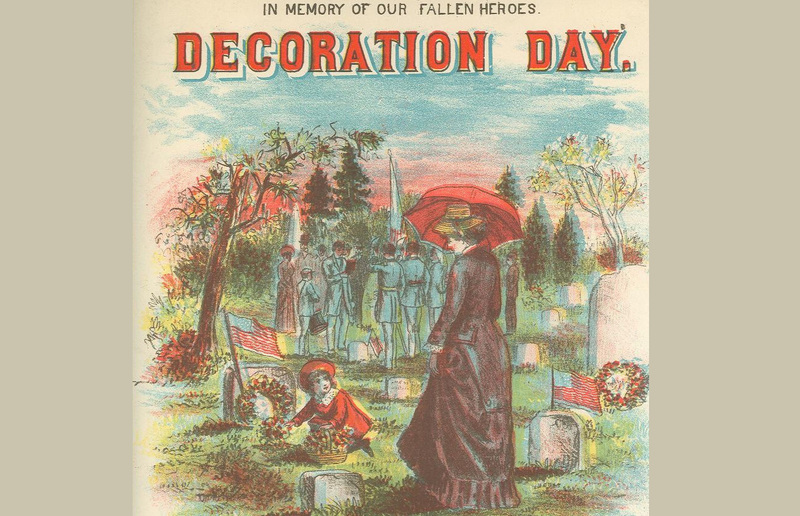 Three years after the Civil War ended, in 1868, General John A. Logan—the head of the Grand Army of the Republic, an organization of Union veterans—established that May 30 should be set aside as Decoration Day, so-called from the tradition of decorating graves with flowers. More than five thousand participants gathered for the first Decoration Day in Arlington National Cemetery and lavished flowers and flags on some twenty thousand graves, and similar events took place in cemeteries all over the country. The commemoration spread more widely in subsequent years and by the 1880s the day was known in some places as Memorial Day, which over the course of the next century became the more common designation. It was only in 1968 that the federal government passed the law that, beginning in 1971, officially shifted the date to the last Monday in May. There is going to be an unwonted parade in honor of the day and I am glad; for usually everybody trots off to Dover or Portsmouth and nothing is done here except to put the pathetic little flags about the burying-grounds. It seems to me that I have just begun to understand how grown people felt about the war in the time of it,—at any rate it brought tears to my eyes yesterday when John said that over two hundred men went from this little town to the war. You can see how many young sons of old farmers, and how many men out of their little shops, and people who had nobody to leave in their places, went to make up that number. This “unwonted parade” almost surely inspired Jewett a couple of years later to write “Decoration Day,” in which a small group of aging Civil War veterans convinces the residents of their small Maine rural village to host a long-overdue procession honoring the local residents killed in the war. In the last century, however, the opinions of critics have been decidedly mixed. When Willa Cather was assembling a 1925 edition of Jewett’s best writings, she belittled it as a “conventional magazine story” and recalled a conversation with Jewett two decades earlier. “When I told her that ‘Decoration Day’ to me seemed more like other people’s stories, she said with a sigh that it was one of the ones that had grown old-fashioned.” Cather convinced the editor at Houghton Mifflin not to include it in the volume. Note: On page 778, Jewett mentions the Wilderness, referring to the Overland Campaign, a series of battles in Virginia during May and June 1864, including the Battle of the Wilderness (May 5–7) in the Spotsylvania area measuring about twelve by six miles known locally as the Wilderness for its dense woods and undergrowth. A week before the thirtieth of May, three friends—John Stover and Henry Merrill and Asa Brown—happened to meet on Saturday evening at Barton's store at the Plains. They were ready to enjoy this idle hour after a busy week. . . . If you don't see the full selection below, click here (PDF) or click here (Google Docs) to read it—free! I wouldn't call it a literary masterpiece, and sure, it is a bit sentimental, but it is a good story and thanks for posting it.